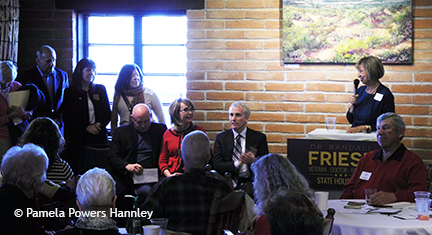 Grassroots volunteers mingled with local and statewide Democratic Party glitterati at the official campaign kick-off event for Dr. Randall Friese, who is running for a seat in Arizona House of Representatives. Friese recently announced his candidacy for one of LD9’s two seats in the Arizona House. Currently, LD9, which stretches from Speedway in midtown north into the Foothills, is a competitive district being served by Republican Ethan Orr and Democrat Victoria Steele in the House and Democrat Steve Farley in the Arizona Senate. Former Giffords’ staffer Pam Simon and Kelly gave impassioned speeches about Friese, who was one of the University Medical Center trauma surgeons who cared for Giffords and others who were shot on January 8, 2011. During Giffords’ long stay in UMC’s intensive care unit (ICU), Kelly and Friese became friends and had many late-night ICU discussions on multiple topics– including politics. According to Kelly, Friese and Giffords are similar in that they are dedicated to finding solutions, not playing politics. Friese was friendly but decisive in his short speech. He laid out five key issues: public education, reproductive rights, responsible gun ownership and universal background checks, marriage equality, and voting rights. As someone who has attended many of these events, Friese’s forthrightness was a breath of fresh air, compared to other politicians who dance around tough issues like choice and gun control– rather than give an concrete opinion. Former Giffords’ staffer Pam Simon introduces Friese, as Giffords, Kelly, Mach, Steele, and Carmona (R to L) look on. Friese, who is trying to oust anti-abortion Christian conservative Orr, made unequivocal statements in support of reproductive rights, contraceptive education to prevent unwanted pregnancies, and marriage equality. Although Orr’s campaign website doesn’t mention any of these issues, he recently signed a pledge to fight for fetal rights and fetal personhood. The pledge was created by the Center for Arizona Policy, a group that fights against reproductive choice and marriage equality and fights for religious exemptions to federal laws. On gun control, Friese asked supporters to send him to Phoenix to seek “middle ground” on responsible gun ownership; this has long been key issue for Giffords and Kelly, who are gun enthusiasts who believe in gun control. Their Americans for Responsible Solutions has played a key role in trying to move the US Congress toward “solutions to prevent gun violence and protect responsible gun ownership”. 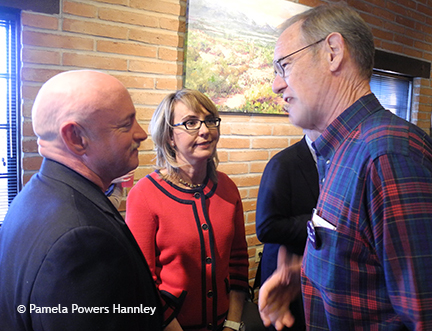 Kelly and Giffords talk with Secretary of State candidate Terry Goddard. According to Friese, the issue is not about taking guns away or about owning as many guns as possible. On marriage equality, Friese said that Arizona is one of 33 states that have stood against marriage equality; he said he doesn’t want Arizona to be “the last state that shakes off its prejudice” about the freedom to marry whom you love. Voter suppression is another key issue where Friese and Orr are on opposite ends of the spectrum. Although Orr’s campaign website doesn’t mention voter suppression as an issue, Orr voted with Republicans to pass the Omnibus Voter Suppression Bill (HB2305) in the dead of night at the end of the 2013 session; more recently, he voted with Republicans to repeal HB2305– thus stopping a citizens’ referendum on voter suppression and paving the way for new anti-voter laws. Orr and the local media have worked hard to paint him as “moderate” Repulbican, but with his pro-life, pro-gun, pro-voter-suppression stances, he’s clearly not a moderate. The choice between Friese– who clearly states his opinions– and Orr– who votes with Tea Party conservatives but dodges tough issues and specifics on his campaign website– is crystal clear. Public Education Supports strong public education system. Wants “smart and successful approach to educating to our children” but no mention of how on his website. 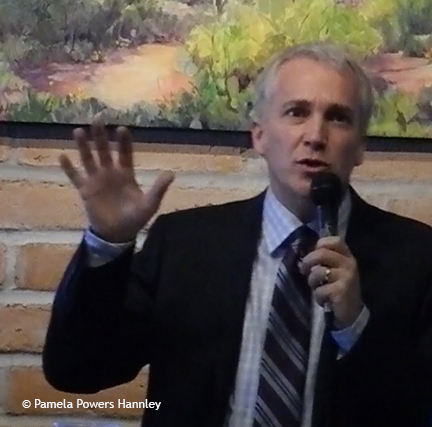 More event photos available at the Tucson Progressive’s Facebook page. Great writing and replay of the tremendous turnout for the Kickoff of Dr. Randy Friese legislative campaign. Just by the enthusiastic and diverse crowd of supporters we can see this Legislative District 9 race will be one of the most hotly contested in the state this election year. Just looking at the current makeup of the current representation, one Democrat and one Republican and the voter registration figures in the House District acknowledges why the interest is already being shown. If the rumors are true the Senate race with two experienced campaigners, one Democrat and one Republican are lining up to take on incumbent State Senator Steve Farley we can expect lots of interest in what otherwise goes with moderate interest in legislative contests. The folks, like myself that reside in Legislative District 9, can expect to be courted for our votes this coming election. Welcome and about time, our state will be well served from this district’s election. Now if a few other districts could match us, what a wonderful new day in the Arizona State Legislature. Thanks for the comment, Harvey. I was wondering if anyone would step up to challenge Farley, since I had not heard anything. The Friese event was great– lots of support. Don’t count on too much. Jeff Rogers and maybe a couple others are recruiting a D, but Farley has done an outstanding job on the ground door-to-door. But, I don’t think it would hurt to let him know playing footsy with Orr defeats Democrats ever getting sanity back to Phoenix. Randy is a really nice guy, but he is substantially lacking in situation awareness, and is prone to make operational decisions based on the influence of people who have no business giving him advice. Not a good choice for Arizona. I don’t know who or what you are referring to. I have talked to him at a couple meetings now and extremely impressed with the depth of his knowledge. I also agree with him on the positions he has taken on the issues we discussed. To me that means something, to have common positions on issues. You know sometimes just being a gentleman and “a really nice guy” in the atmosphere of political heat doesn’t hurt one bit. I think this describes Ethan Orr to a tee! This entry was posted on February 10, 2014 by Pamela Powers Hannley in 2014 elections, Arizona, Arizona Legislature, Choice, Democratic Party, Ethan Orr, Gabrielle Giffords, Randall Friese, Republican Party, Tucson, Uncategorized and tagged abortion, Arizona Legislature, choice, Ethan Orr, Gabrielle Giffords, gun control, marriage equality, Randall Friese, Tucson, Voter suppression.